A trip I take is not successful until there are at least three U-turns! Look for the good wherever you are. Take care.. I love the idea of a do over. That is what my life is right now. Lost my husband of almost 39 years suddenly New Year’s Eve. If I could just make a U-turn before he died, I’d make a few important changes and over ride the ER Doctor and have been more forceful about his care. I am so very sorry for your loss, Cindy. I hope you find peace. I wish there were some things we could do over too…. Love your outlook on life, Ami. My life has been filled with “explorations”, i.e., getting lost and then getting found again, and it sometimes takes some — many! — u-turns to get where I need to be…thanks to maps, GPS and a number of good friends. Hugs! Happy Valentine’s Day to you, too. I love your message. I need to remember that more often. The cow is wonderful. Couldn’t help but notice that this was posted at 2:45 AM. Ami, for doing so much for Alzheimer’s research and for making quilting, not only fun, but funny and even laughable, you deserve a peaceful night’s sleep with no doubts. Claudia is my kind of woman. There are times I wished the hubby would make those U-turns. Missed many of them but survived. God uses those mistakes to strengthen us. Great photo and great advice. Thank you! I’m also a u turn lover. My mother inlaw finds this a bit dismaying, but we’ve found some marvelous sights from WA State to Texas. Fond memories! 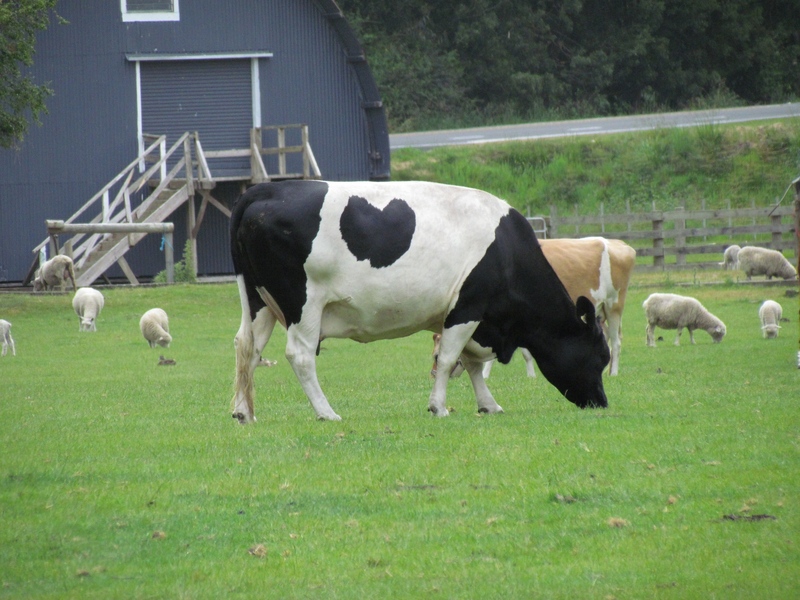 I love the heart on the side of the cow, myself. Oh, and what you said! !